14k Gold Medical red enamel Curb ID bracelet. Stylish and necessary, this lifesaving bracelet measures 8 1/2mm wide and 10 1/2 wide at the ID link. ID plate measures 40mm in length and we're happy to engrave this for you. Made in the USA, bracelet weighs 23.6grams. Gorgeous 14k Gold Stylish polished fancy Men's bracelet. 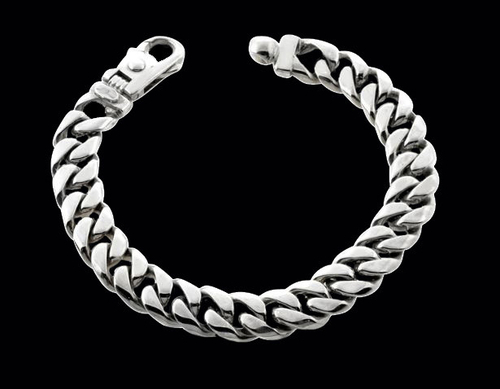 This handsome Italian bracelet measures 9mm in width and 8 inches long. Incredible hand-made bracelet weighs about 9.74grams. This design is concave and hollow. Very secure box clasp. 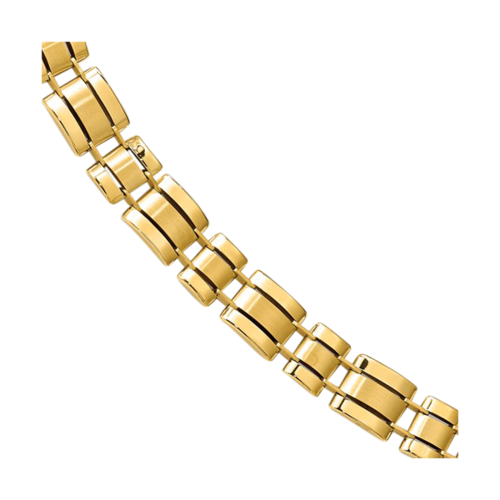 Men's 14k Gold Polished fancy link bracelet. This high quality Italian made bracelet measures 8.5 inches in length and weighs 10.14grams. An amazing bracelet with a fancy lobster clasp. This design is solid with a polished finish. 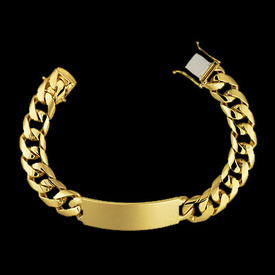 Men's Handsome Classic 14k Gold link bracelet. 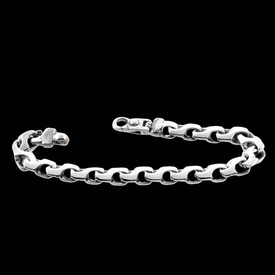 This Italian crafted Men's polished bracelet measures 8 1/2 inches in length by 5.75mm wide. Bracelet weighs about 9.57grams and is secured with a fancy lobster clasp. Part of our Lifetime Guarantee collection. If ANYTHING happens to this bracelet return it with original invoice for a replacement. If the style is no longer available we will replace with similar same value item. 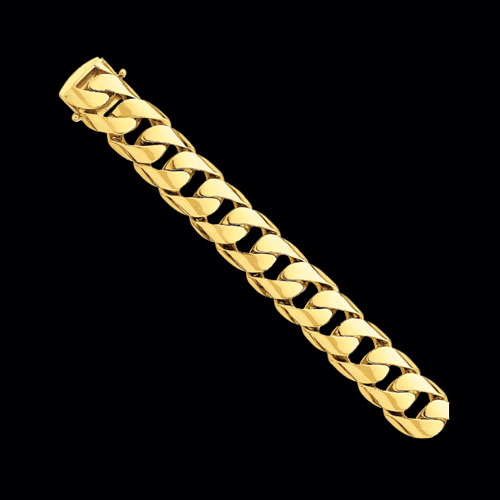 Handsome Men's 14k Gold link bracelet. This Italian crafted Men's polished bracelet is a two tone design that measures 7mm wide and 7 3/4 inches in length. Bracelet weighs about 11.62grams. Secured with a fancy lobster clasp. Part of our Lifetime Guarantee collection. If ANYTHING happens to this bracelet return it with original invoice for a replacement. If the style is no longer available we will replace with similar same value item. Italian Men's Polished link bracelet. 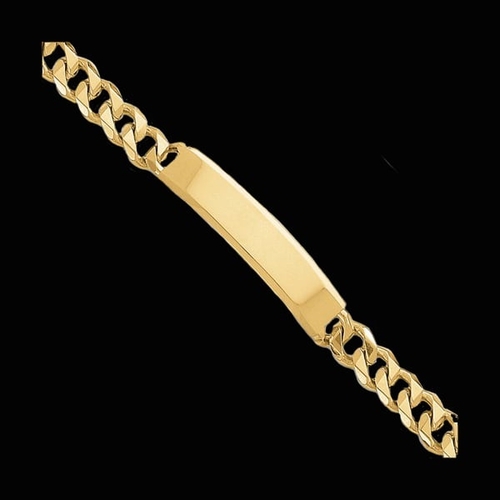 14k gold men's bracelet measures 7 3/4 inches in length and measures about 7.45mm in width. Finely crafted Italian bracelet weighs about 13.85grams. Secured with a fancy lobster clasp. Part of our Lifetime Guarantee collection. Stylish 14k Italian Two Tone Gold men's bracelet. This beautiful men's bracelet measures 10.95mm wide by 8 1/2 inches in length. Italian gold bracelet weighs 22grams. Masculine bracelet weighs 21.84grams. This bracelet is a watch band design. Secured with a fancy lobster clasp. Part of our Lifetime Guarantee collection. Gorgeous Fancy 14k Italian Gold men's bracelet. This handsome men's bracelet measures 10.7mm wide by 8 1/2 inches in length. Italian gold bracelet weighs 22grams. Unique design stands out from the crowd. Secured with a fancy lobster clasp. Part of our Lifetime Guarantee collection. Beautiful 14k Yellow gold Hand-Polished Traditional ID bracelet. This ID bracelet measures 10mm wide and our price shown is for the 8 inch length weighing about 36.9grams. This classic traditional link is sure to be a favorite. Secured with a box catch. We are happy to engrave this for you or of course you can have it engraved locally. Handsome 14k White gold Beveled Curb bracelet. 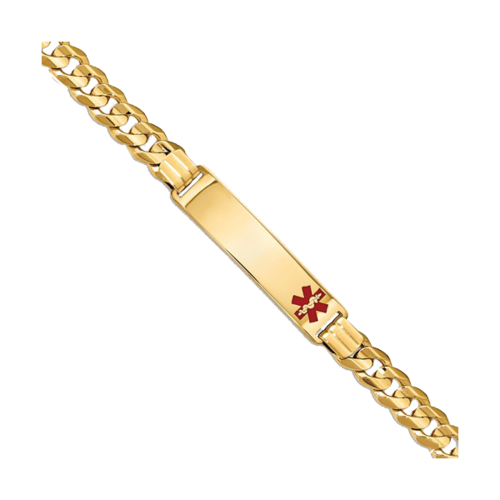 This finely crafted Italian made bracelet measures 8.5mm wide and 8 inches in length. Gram weight is about 14grams. Bracelet is part of our Lifetime Guarantee collection and Rhodium plated for a bright white finish. This curb bracelet is handmade and features a lobster claw clasp. Gorgeous 14k White or Yellow gold Men's polished bracelet. This very handsome bracelet is made in Italy and measures 8 inches in length. Gold bracelet is 9mm wide and secured with a lobster clasp. Bracelet weighs 9.6 grams. It's part of our "Lifetime Guarantee" collection. If this item breaks or is damaged for ANY reason simply send it back and we'll replace it!!! If the item is no longer available we will replace with similar value item. You just can't beat that kind of risk free shopping. A beautiful bracelet, guaranteed for life. Gorgeous 14k Yellow or White gold Hand polished rounded curb chain. Price shown is for the 13mm wide bracelet weighing approx. 92.6 grams and 9 inches in length. This style is available in 14k White, 14k Rose, 18k Yellow, 18k white, and Platinum. Very solid chain is secured with a heavy box clasp. Any custom length is available, email for pricing. Gorgeous 14k Yellow gold bold curb ID bracelet. 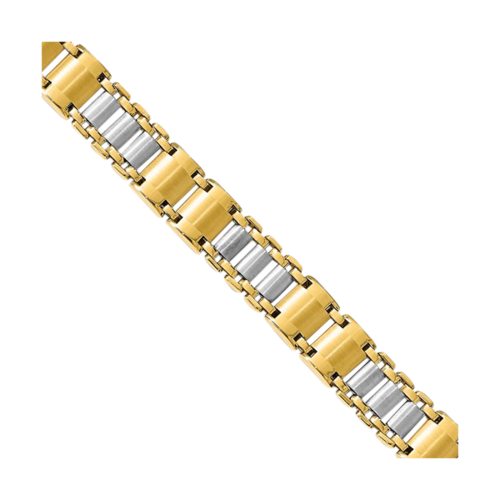 Gold ID bracelet measures a fabulous 13.2mm wide and is secured with a box tongue and safety clasp. This is a solid curb and price shown is for the 8.5" length. Also available in an 8" or 9" length. You'll love this masculine bracelet. Gold Curb bracelet. 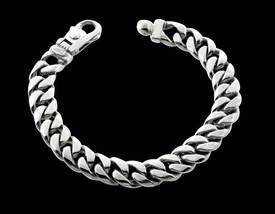 This gorgeous very sophisticated Men's curb style bracelet weighs an incredible 101grams and measures 11.5mm in width. You'll love this incredible heavy hand made, hand polished curb chain. Our price shown is for the 8 1/2 inch length. This bracelet is custom made to order and available in any length. Also can be made in 14k Yellow or Rose gold, 18kt golds, or Platinum. Use our request email link for additional pricing. Handsome 14k Gold fancy Mariner style bracelet. 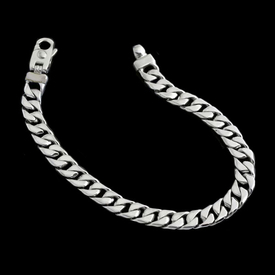 This stylish bracelet measures 8.75mm wide and our price shown is for the 8 1/2 inch bracelet weighing about 36.5grams. Because this is made to order we are able to create in any length and a variety of metals including 18k and Platinum. Secured with an incredible quality lobster style clasp that blends beautifully with the link. You'll love this custom hand made hand polished bracelet, it's absolutely gorgeous. Use our special request email for additional pricing. Handsome Gold Piston bracelet. 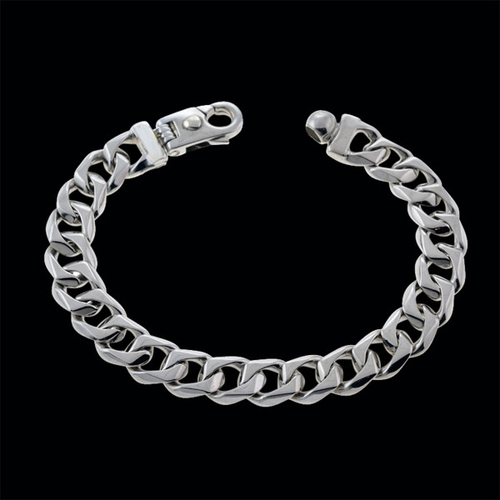 This rugged design Men's bracelet weighs about 44.5grams for the 8 1/2 inch bracelet length that measures 8.25mm in width. You'll love this stylish hand made, hand polished Piston bracelet. This bracelet is custom made to order and available in any length. Also can be made in 14k Yellow or Rose gold, 18kt golds, or Platinum. Use our request email link for additional pricing. 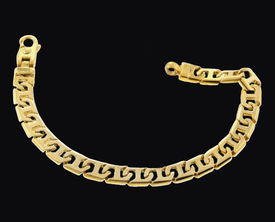 Stylish 14k Gold fancy link bracelet. This handsome bracelet measures 10mm wide and our price shown is for the 8 1/2 inch bracelet weighing about 37grams. Because this is made to order we are able to create in any length and a variety of metals including 18k and Platinum. Chain design also available in custom lengths. Secured with a very secure lobster style clasp that blends beautifully with the link. You'll love this custom hand made hand polished bracelet, it's absolutely gorgeous. Sophisticated Squared Curb design men's bracelet. This absolutely gorgeous 14k Gold men's bracelet measures 12mm wide, 8 1/2 inches in length, and weighs about 85grams. Because it's made to order we are able to create in any length. Our squared curb design bracelet is also shown in 14k white gold but also can be ordered in 14k yellow, 14k rose, or 18kt gold options. Additional widths available in our men's chain category. Secured with a very secure lobster style clasp that blends beautifully with the link. You'll love this custom hand made hand polished bracelet, it's absolutely gorgeous.